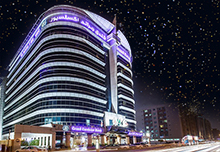 Located in downtown Bur-Dubai the Grand Excelsior Hotel is a short taxi ride from the city’s popular historical districts, attractions and shopping including the Dubai Museum, Old Bastakiya Quarters, Grand Mosque, the Heritage Village, Dubai Mall, Burj Khalifa, Dubai Opera, Dubai Frame and the Burjuman Shopping Mall. With an eye catching blue glass façade, the Grand Excelsior Hotel boasts a striking open-plan atrium which is the heart of the hotel. Panoramic glass elevators are a signature feature allowing breath taking views of the lobby. Arranged over seven floors, the 282 rooms, studios and suites blend contemporary Arabic design with spacious layouts. Every room and suite has been carefully designed to provide guests with the maximum use of space and create separate areas for working, relaxing and sleeping. Studios and suites feature a private balcony to soak up views of the city, Sheikh Zayeed Road and the Burj Khalifa downtown. The Grand Excelsior Hotel was originally built as a 5 star international class hotel, but rebranded itself as a 4 star property to fill a niche market for those who desire both affordability and comfort. 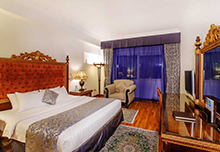 The large deluxe and elegantly decorated rooms of the Dhow Palace will add to the quality and comfort of our tour. The Dhow Palace boasts a number of international restaurants and an intimate bar which is the perfect meeting spot for group Members to get together and enjoy a drink. 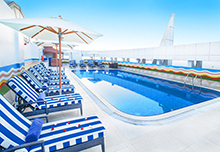 A magnificent outdoor swimming pool with jacuzzi, health club, sauna, massage rooms are also facilities to be enjoyed.